Intelligent search engines will show alternative products or searches when users search for something that returns no results. Messaging on product results pages are used when this has happened. It is an opportunity to inform customers why they’re seeing a particular set of products and it is imperative that users quickly understand what has happened so that their confidence in the search system is maintained. “sofaa” returned no results, so we’re showing you results for “sofa” instead. It is, of course, necessary that your spell correct function is up to the job in the first place. An intelligent search engine will check spellings against the company data as well as a dictionary. “Gracey Recliner” returned no results, so we’re showing you results for “leather recliner” instead. The Gracey recliner is currently unavailable. If your business does not stock a particular brand, but does stock brands who produce similar products, it is important to redirect your customers to relevant alternative products. An electronics supplier might display a message such as: “Sorry, we don’t stock Canon, but Nikon is an excellent alternative”. Simply telling your customers that you don’t stock a particular product or brand is a missed opportunity. With certain customer search queries, part of a search may need to be relaxed. If a user’s search has been changed in this way, a message explaining the changes to the original search should be displayed. For example, a user may search for “purple leather couches” and see the following message: “Sorry, we don’t have purple leather couches, but here are the leather couches we do have”. This user could have searched for leather couches in the first instance and spent a long time scrolling through the pages of results looking for any in purple. But by using messaging in this way, the user is informed immediately and is more likely to use the search system again. The key to messaging is letting the user know what is happening. If there is a message that could be conveyed, it should always be displayed, and the more explicit you can be, the better. This gives the user confidence in the search system. Conversely, if no message is displayed when changes have been made to a search, it is confusing for the user. If, for example, an alternative brand of product is presented with no messaging to explain why, the user may assume that the search is not working, lose confidence in the search system and even abandon the site. Ideally, there would be multiple messages set up for different purposes. 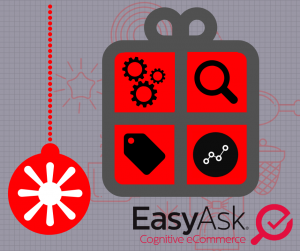 Implementing messaging on product result pages is straightforward to set up and configure with EasyAsk’s intuitive search solution.